COMPLEX releases the xbox360 version of the action game Syndicate. 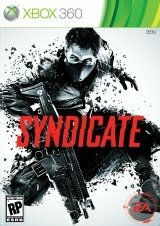 Description: Set in 2069, Syndicate takes players into a dark, Machiavellian world run without government oversight with many syndicates vying for total dominance of their local market place. With no one to question their intentions or actions, three mega corporations – Eurocorp, Cayman Global, and Aspari – are at the forefront of this brutal war for control of the pivotal American market.